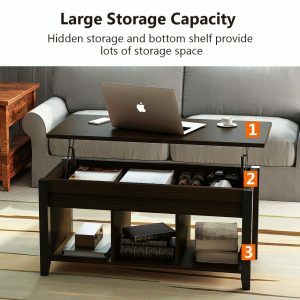 TribeSigns Coffee Table has quite a special, versatile, two-tier rectangular design for use in small to medium-sized living rooms with a lift top, hidden storage, and lower shelf. You have two color options of dark teak (HOGA-17008) and rosewood (HOGA-17009), whichever may suit your living room decor better. It is very practical and functional and spacious inside and offers you nice storage space that you can use to hide stuff from your little kids, dogs, and cats. You can put your laptop and papers on the large tabletop and work or have your meal on it while sitting on the couch and watching your favorite show on TV. With the integrated robust soft-close lifting mechanism you can move it up and down slowly and smoothly. And there will be no accidents thanks to the tabletop closing gently. It has the smooth round edge corners that are safe for your toddlers or anyone in the house as bumping your legs into them will be nothing like sharp corners. TribeSigns Coffee Table has a solid construction and feels stable without any wobbling or shaking with the great sturdy and durable hundred percent pine wood legs. It is easy to put together with all the pieces labeled properly, easy to read instructions and tools provided. You only need to follow the instructions word by word. 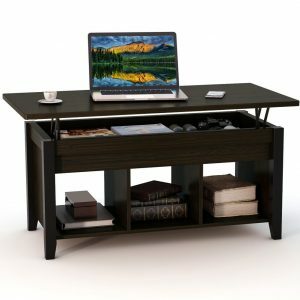 It is designed for versatile use, as a laptop desk, dining table, cocktail table, living room table and a regular coffee table. Both the dark teak and rosewood color TribeSigns coffee tables are made of sturdy pine wood and MDF. Only the legs are pine wood, and the rest of the coffee table, including the tabletop and the shelves, are made of solid MDF. You have these two color options, you need to pick one and the unit is not suitable for painting. And the price is the same for both at the time of this review. It is a solid piece of furniture that weighs a little over 50 pounds (shipping weight of 54.5lbs) with the measurements of 41.3 x 19.5 x 18.5 inches. It will not occupy a lot of space while offering ample storage inside. The height goes up to 24.6 inches when you lift the tabletop and the gap between the bottom part and the floor is 3 inches. In the lifted position it can carry a total weight of up to 30 pounds and will not collapse easily even when you push it down. You will get a warranty of 18 months and a decent customer support during this quality assurance period and after. It appears to be pretty good value for money with positive reviews online.